Today, we’ve rounded-up 40 of the most incredible DIY serving tray projects from lands far and wide. From pastel and metallic designs, to those involving paint, paper, fabric, or wood – trust us, there’s bound to be something here for everyone! If you find yourself regularly collecting bottle caps, why not put them to good use? Addicted 2 DIY has created a DIY serving tray which is decorated with them – genius! We love the versatility of this DIY serving tray from Alice and Lois! Simply find some gorgeous wrapping paper, fabric, or wallpaper and line your tray with it. So simple! Here’s a fun DIY serving tray idea that your kids can create in time for Mother’s Day! Alpha Mom will show them how it’s done. Who doesn’t love a New Year’s Eve inspired serving tray? Aww Sam has created a DIY confetti version for Brit + Co, so be sure to check out the full tutorial! Flower power will always be on-trend, so why not celebrate the style by making this DIY serving tray from Aww Sam? Use your favorite fake flowers for a design you’ll adore. We all love Kate Spade home wares, but sometimes just can’t afford the luxurious price tag that comes with them. Thankfully, Beauty and the Beard has created a Kate Spade inspired serving tray for just a few dollars. Yay! This colorful and patterned serving tray is incredibly easy to make, just ask Blue I Style! You’ll have one whipped-up in no time at all. Check out this awesome tutorial from Very Create to spice up an old or boring serving tray. Her step-by-step tutorial only takes about 10 minutes and looks amazing! With an eye-catching pattern like this, who could resist this stunning DIY serving tray from Centsational Girl? It’s perfect for breakfast in bed or serving guests coffee and tea. Geometric patterns are very on-trend right now, so imagine our delight at discovering this DIY serving tray from Charming Zebra? Its bold color is very eye-catching too! Your DIY serving tray needn’t be colorful or overflowing with patterns. If simple is not your style, then you’ll love this DIY wooden serving tray from Coffee and Pine. So stylish! We love these watermelon serving trays from Consumer Crafts – aren’t they great? This full tutorial will teach you how to replicate the summer inspired and vibrant DIY project. Add some much-needed pizzazz to any space thanks to these glamorous and glittery serving trays from Delineate Your Dwelling! Want to recreate one for yourself or a loved one? Check out the full DIY tutorial! Wow, this colorful abstract serving tray from Enthralling Gumption is incredible – who would’ve thought you could create a masterpiece like this within an hour or two? Speaking of abstract art, here’s a similar idea from For the Makers, this time featuring a brush stroke inspired pattern! Artists and art lovers are going to adore this step-by-step guide. All hail the watermelon! This colorful design is certainly on-trend of late, so now you can incorporate it into your kitchen décor, thanks to this tutorial from Handimania. Again with the fruit! These punchy patterns just scream summertime, don’t you think? Instructables will show you how to make these for yourself. This DIY serving tray from I Spy DIY ensures that you only put things on it which you consider to be ‘yum’! This is a simple yet fun idea that you’re going to love. Bring the tropical holiday feeling into your home with this tropical leaf serving tray project from I Spy DIY! Your guests will want to know where you bought it from, so be sure to point them in the direction of this tutorial. I Spy DIY certainly loves her serving trays – and we do too! This fun tutorial will teach you how to incorporate the word ‘Cheers’ (or any word of your choosing) onto your tray. Brilliant! Oh my – talk about fancy! Lauren Conrad has a tutorial to teach you how to make this stunning gilded edge marble slab serving tray. It almost looks too good to eat off! Here’s a fun way to add plenty of color to an old or boring serving tray. Making it Lovely has an awesome, step-by-step tutorial to help you achieve the look. Here’s another wonderful marble serving tray you can make within an afternoon, this time from Pennies for a Fortune. The secret to this DIY project? The marble will only cost you a few dollars 😉 Read the full tutorial to find out more! Fancy creating a one-of-a-kind monogram serving tray? Pretty My Party has got you covered with this DIY tutorial teaching you how to make this wonderful design! 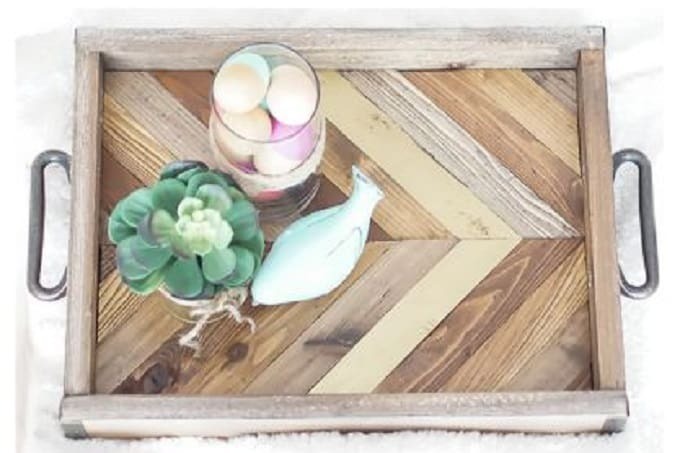 This DIY wood slice serving tray from Project Nursery is surprisingly stylish. It’s so easy and affordable to create, so you won’t want to miss this full guide. Reality Daydream will teach you how to make an old tray into a gorgeous decorative mosaic tray using just about anything as the mosaic! How’s that for clever? Bring nature into your home with this DIY pressed flower serving tray from Say Yes. It’s got a lovely, old-fashioned beauty about it, don’t you think? If you want a DIY serving tray that walks on the wild side, why not create this leopard print one from Simple Details? It’s as simple as using your favorite animal print adhesive or wrapping paper. Too easy! If wood is your thing, then this DIY tray from Simply Designing will be right up your alley! It has that perfectly rustic aesthetic that we all love. Here is a fantastic DIY serving tray idea that you can incorporate into your big day! Something Turquoise has created a tutorial to help you recreate this guest book tray. Now you can feel all warm and fuzzy while reading your guest’s comments and sipping on your morning coffee. This is such a quick and easy DIY serving tray idea from Style Me Pretty. You can simply incorporate a herringbone pattern using just a bit of your favorite paint. Here’s another chevron inspired DIY tray idea from Style Me Pretty, this time featuring gold foil. It’s shiny, stylish, and surprisingly super affordable! Reminisce about your favorite travels or invoke a sense of wanderlust each morning, thanks to this DIY map serving tray idea from The Country Chic Cottage. What map will you incorporate into your design? Here’s a very sweet DIY serving tray idea that your children can take part in too! Simply get them to draw some hearts on the tray using Sharpie pens. Be sure to check out the full tutorial from The Every Girl! The Happy Housie Porch will show you how to recreate your own hexagonal pattern serving tray. You can use any variety of patterns and colors too! With its unique, Gatsby-inspired aesthetic, we think this DIY serving tray from The Lovely Drawer will make many appearances at fancy dinner parties! Here’s an incredibly fun and quirky idea from Three Little Monkeys Studio. This talented blogger has turned a dinosaur figurine into the most awesome serving tray! Twinspiration have created an awesome faux marble serving tray using gold antlers as the handles – how unique! When it’s not in use for serving food, you could also use it as home décor in your space. Two Twenty One shows us that customizing a clear plastic tray is as easy as 1,2,3. Simply line the bottom with your favorite paper for a quick but stylish design. Neon colors and geometric shapes – it’s a designer’s match made in heaven! Washi Tape Crafts has created this cool DIY serving tray and now she’s going to show you how you can recreate one too. 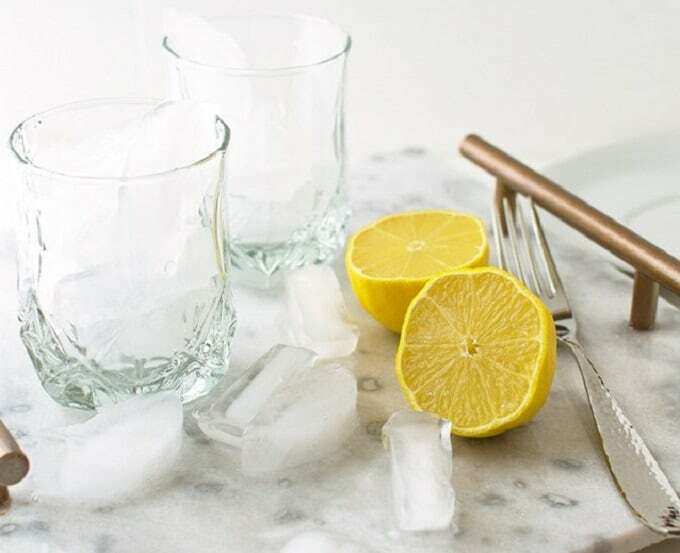 There you have it – 40 amazingly easy DIY serving trays! Which projects were your favorites? We’d love to hear from you in the comments section below!